Engage your current and target customers while showcasing your commitment to sustainability and your work with the Rainforest Alliance through a variety of activations. Whether you are currently using the Rainforest Alliance Certified™ seal or working with Rainforest Alliance on your business’s sustainability journey, below are just a few ideas to get your creativity started. Email us about your plans for Follow the Frog events or promotions and we will share it with our followers. Host an event highlighting your work on sustainability with the Rainforest Alliance or your Rainforest Alliance certification. Host a tasting or demo highlighting your products that display the Rainforest Alliance Certified seal. Use the Follow the Frog point-of-sale materials to decorate the venue. Invite local press and bloggers and encourage them to send a photographer or video crew. If they can’t attend, offer to send them your own images of the event for publication. Inform and motivate your employees about the work of the Rainforest Alliance through staff training events. Run an offer, competition, or giveaway of your food, paper, or wood product(s) featuring the Rainforest Alliance Certified seal. Run a promotion for your Rainforest Alliance Certified tourism business. Promote your activities on social media using our Follow the Frog downloadable images and hashtag #FollowTheFrog. See our tips on social media promotion. Decorate your premises with Follow the Frog point-of-sale materials. Invite local celebrities, officials, or influencers to help draw customers into your store. 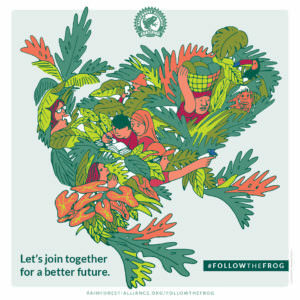 Take photos and share them with your social networks using the hashtag #FollowTheFrog; you can also spotlight photos on your website and include them in future promotions. Tell your local press about your Follow the Frog activity and invite them to attend. Follow up afterwards with photos and a press release. Run a competition or special offer (discount or giveaway) linked to your products that feature the Rainforest Alliance Certified seal, certified tourism business, or your work with the Rainforest Alliance. Download and use the Follow the Frog online banners to promote the offer on your website. Launch and promote your Follow the Frog activities on Twitter, Facebook, and Instagram. One reminder as you plan an event and/or promotion: all uses of the Rainforest Alliance Certified seal, logo, and the Rainforest Alliance name must be reviewed and approved prior to release, so please stay in touch with us! We’d love to chat about your promotional ideas and needs around competition prizes and giveaways. Contact Debbie Rutstein at drutstein@ra.org.